The designing duo behind label Proenza Schouler claim they always visit somewhere new to find inspiration for the upcoming season. But judging by some of the pieces on the catwalk yesterday, it was more like some lodge in Africa. The safari theme, which has surfaced in a few shows at New York Fashion Week including Michael Kors and Donna Karan, cropped up again at the 330 West Street event. Zebra-print, browns and nudes were splashed hues of greens and blues in the form of tailored short suits - another hot trend - revealing bare, long legs and pencil skirts slashed to the thigh. 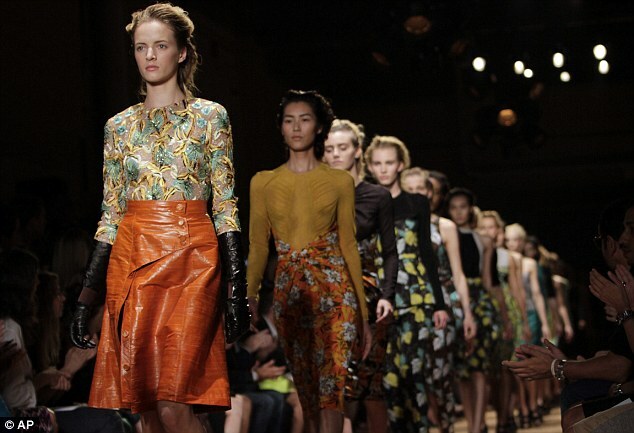 The show evolved into classic stronger prints and bold colour with a Forties twist. The Pacific inspiration creeped in in the form of bandeau bikini tops and sarong-style skirts. Hawaiian inspired prints and platform shoes walking on a thick shag carpet made sure the Seventies were not yet forgotten. Black dresses with cut-out panels made for a dramatic effect but it was texture that was the star of the show. Eel-skin, raffia, crochet wool, leather gloves and embellished silks made pieces stand out. The American label is set to expand into more accessories and a denim line is on the way. Judging by the show - the hottest ticket in town attended by Alicia Keys, Rachel Zoe and Alexa Chung to name just three - it will be a hit. And the secret to the partnership's success? Their energy - and synergy.